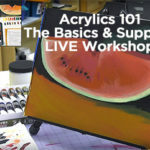 Tonal palettes that will change your painting forever — See colors just as they will appear on your canvas! 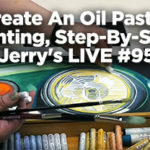 We are so excited here at Jerry’s Artarama that the new line of Mijello TruColor Neutral Grey Palettes have come into stock! 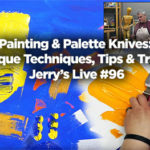 This is such a revolutionary line of palettes, and we’re sure they will change your painting method as soon as you try them out. 3 styles are available: the Ellipse XL, the Artelier Airtight, and the Fredi Weber Tray — one for any painter in acrylics or oils! Like most of the Mijello palettes, TruColor palettes are made from exceptionally strong, impact and solvent-resistant ABS plastic — the same stuff that is used to make construction hardhats and the like — so you know they’ll last. The major advantage of TruColor palettes, however, is of course their unique, true middle grey coloring: the perfect tone for achieving lifelike color mixes! Sure, your canvas may start out as a blank, white surface, but it won’t stay that way for long: why mix your colors on a blank white palette? White surfaces cast reflections and shadows that affect the appearance of the colors mixed upon them. What looks like a nice dark color on a white palette may turn out to be a muddy mess on a toned canvas. Using a neutral grey palette virtually eliminates this issue! Know immediately if a color is too light or too dark right on the palette: don’t risk ruining your painting by applying the wrong color. Aside from being the ideal color-mixing surface, Mijello TruColor Palettes are also the easiest palettes to clean! Let acrylic paints dry on the surface and they peel right off like a window-cling. 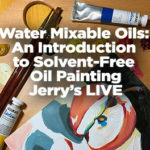 Oil paints can be wiped away with turpentine or mineral spirits — without staining the palette! In fact, you can use the Artelier style palette to store acrylics for days without drying out, and by wrapping the palette in plastic wrap and putting it in the freezer, you can keep oil paints fresh almost indefinitely! So really, is it any wonder we’re excited? When it comes to painting in acrylics or oils, we’ve finally found the perfect palette! Mijello TruColor Palettes have everything we’re looking for: a neutral grey tone for perfect color mixes, ABS plastic construction for durability, an easy-clean surface that doesn’t stain, and three different palette styles to choose from. Pick one out for yourself today, we’re sure you’ll love it just as much as we do!